ALWAYS SHARP - Make sharpening your favorite knife a thing of the past. Because of our triple serrated blade design, even with daily use the Edge Knife will always be sharp and never require sharpening. This knife eliminates the smashing and tearing through foods you get from using a dull blade and effortlessly cuts through any food like a hot knife through butter. It's so powerful that it can cut through wood or even a tin can without dulling the blade! VERSATILE - Slice bread, tomatoes, saw bone, portion frozen meat, carve a roast, chop veggies and much more. Soft or hard, there is no food it can't slice without precision. 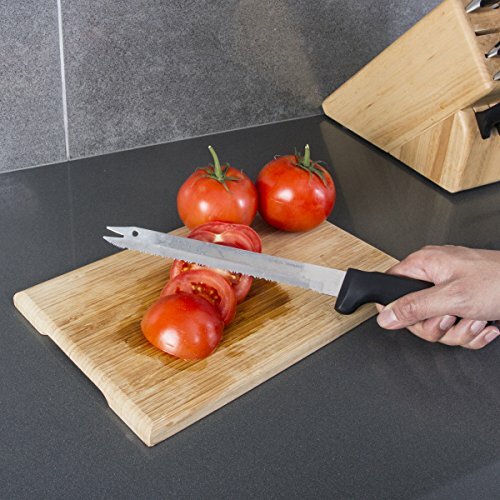 Big enough to chop melons and pineapples, but enough control to effortlessly slice paper thin tomatoes. The Edge Knife is the perfect utility knife for residential, commercial and professional use. PREMIUM QUALITY - Get the same results that expensive professional level cutlery provides, but at a fraction of the cost. Made of high quality forged surgical stainless steel that will not rust, tarnish or dull. The ergonomic handle is made of nonporous, nonslip ABS to ensure a safe grip and a comfortable, yet lightweight design to minimize fatigue from repetitive cutting. 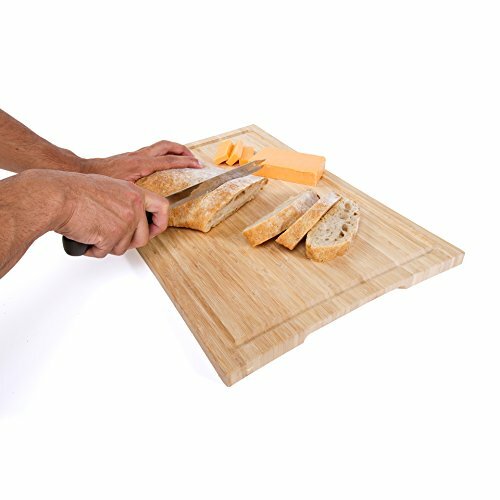 Not just a sharp blade, the fork tip allows you to move sliced pieces without the need for a second utensil. SURGICAL GRADE - Our long 8" razor sharp slicing blade is crafted with high quality surgical stainless steel that delivers flexibility and precise cuts with minimal effort. The unique triple set serrated edge design creates pockets of air that reduce food sticking, creates less friction and prevents the tearing that's common with other knives. Let the knife do the work for you and cut through any food with ease. 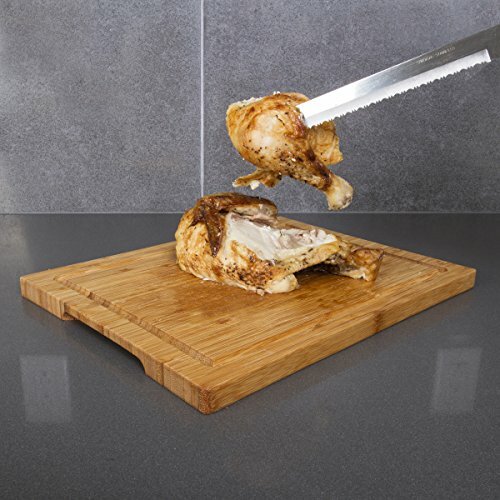 Cut right to the bone or up to the skin thanks to its sharp edge and flexing action. LIFETIME WARRANTY - Stop shopping around for fancy alternatives that won't cut any better and put our knife to the test with a risk free 30 day 100% Satisfaction or Money Back Guarantee. We are so confident in the quality of our knife that for the past 30 years every Edge Knife has been backed by our full manufacturer's Lifetime Warranty, so you can buy with confidence! 8" Ultra Sharp Surgical Stainless Steel Serrated Edge Knife - Our long 8" razor sharp slicing blade is crafted with high quality surgical stainless steel that delivers flexibility and precise cuts with minimal effort. The unique triple set serrated edge design creates pockets of air that reduce food sticking, creates less friction and prevents the tearing that's common with other knives. Let the knife do the work for you and cut through any food with ease. Cut right to the bone or up to the skin thanks to its sharp edge and flexing action. 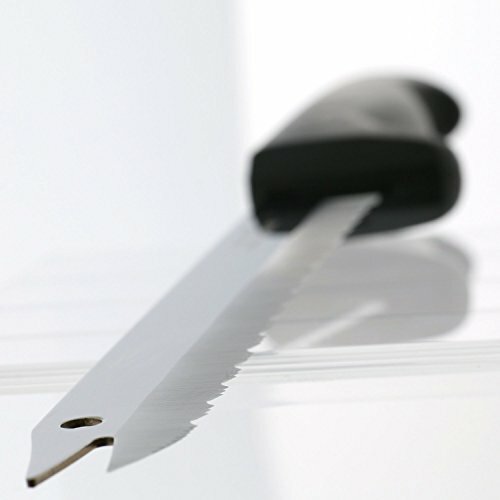 Our triple serrated blade design has made sharpening knives a thing of the past. It is so powerful that it can cut through wood or even a tin can without dulling the blade. Cut through any food like a hot knife through butter without the need of tearing through foods you get from using a dull blade. 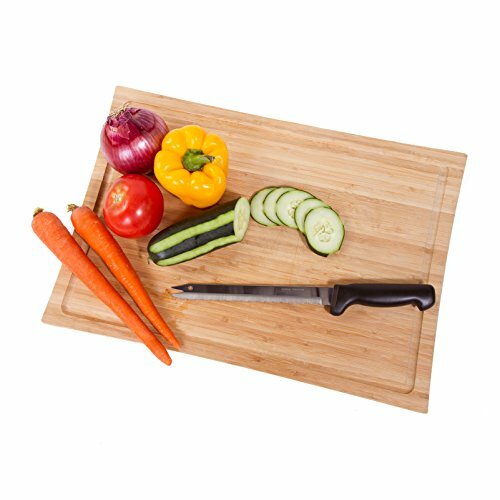 Slice and cut everything like tomatoes, frozen meat, veggies, carve a roast, melons, pineapples and much more. Edge knife is the perfect utility knife for residential, commercial and professional use. Forget all other expensive knives, our knife can achieve the same result as any other expensive knives at a fraction of the cost. Made with high quality forged surgical stainless steel, the edge knife will not rust, tarnish or dull. The ergonomic handle is made of nonporous, nonslip ABS to ensure a safe grip and a comfortable, yet lightweight design to minimize fatigue from repetitive cutting. Not just a sharp blade, the fork tip allows you to move sliced pieces without the need for a second utensil. Our edge knife has been backed by our full manufacturer's lifetime warranty for the last 30 years, therefore, we're so confident that you will be pleased with the quality of our knife. Stop shopping around for fancy alternatives that won't cut any better and put our knife to the test with a risk free 30 day 100% satisfaction or money back guarantee. Dishwasher safe, but handwashing is recommended.